She might be a junior in high school and a minor in the eyes of the law, but she’s at the top of the charts when it comes to going fast on the ice. 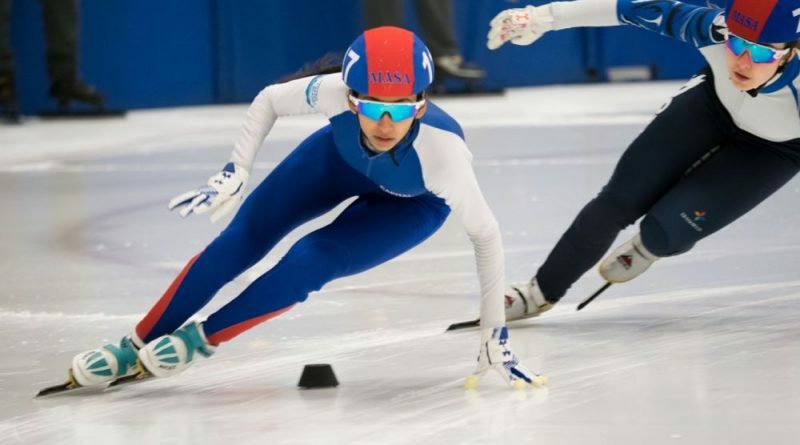 Loudoun Valley High School Junior Shreya Arun, 16, won the short track U.S. Speedskating national championship for her age category in Verona, WI last month, winning three of four events by a combined total of nearly one full second. Shreya, who’s now been speed skating for seven years, beat 10 other girls aged 16-17 in the 1,500-meter race with a time of 2:42.725, the 1,000-meter race with a time of 1:44.145 and the 500-meter race with a time of 50.642 seconds. Of course, to get to that point, she’s had to work hard almost every day of the week since age 9. Shreya’s road to success began when she was a figure-skating kindergartener living in Columbia, MD. When her skating practices were through each day, Shreya said she stayed to watch the speed skaters zip around the rink. “I wanted to try it,” she said. She did exactly that just a few years later. Once that phase of her life began, Shreya said she was busy training at the ice rink four days a week for three hours at a time and cross training at home all the other days of the week for an hour and a half, performing exercises like weight lifting, cycling and others to build her endurance. Shreya also attended speed skating summer camps for three weeks at a time and one-week winter camps. She now skates for the United Capital Blades Speedskating Club. Now approaching the end of her junior year in high school, Shreya has already been to four other national speed skating competitions, with her first-ever win coming last month in the Junior Ladies AB category of the Short Track Age Group National Championship. Although she was confident in her capabilities, Shreya said the win was a pleasant surprise. “I didn’t think I’d be winning—I was hopeful, but I knew there were other factors that would prevent me from [winning],” she said. But by the end of day two in the three-day competition, Shreya said her first-place position was secure to the point that her win was confirmed. “It was very exciting,” she said. Off the ice rink, Shreya is also the CEO of iloom, a company she started in October that gathers returned items from different manufacturers and donates them to charities. She said she started that business after a family friend asked her and three friends, who also help run iloom, to take returned products off his hands and do something with them, rather than leaving them sit in a warehouse and cost him money. Moving into the future, Shreya said she’s hoping that iloom will win the Step Up Loudoun Youth Competition this Thursday, April 12, to win funding to advance the company’s plans. As for speed skating, she’s training for the Youth Olympic Trials in October to get the chance to represent the U.S. in speed skating during the Youth Olympic Games in Lausanne, Switzerland next year. Shreya is also aiming to become a pediatrician one day.